Community: North Idaho B & B Assoc. front porch with sitting area. bath features double sinks, jetted whirlpool bath, separate shower. just out on the large private deck overlooking the mountains! opens to your private deck with hot tub and seating area. internet are yours to enjoy. requires the sharing of facilities with one of the other suites. prepared for your full Country style breakfast. while here at the "Ranch". Traveling with your horse, we've got a place for 'em!! Trout fishing, rafting, boating & camping at the Coeur d'Alene River. underground rollercoaster and 60 other attractions & water park. certificate to one of our fine dining establishments. coffee / tea bar & "Bottomless" Cookie jar!! 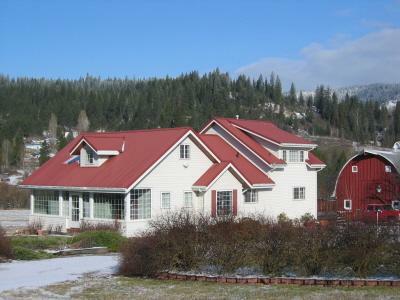 The famous Kingston 5 Ranch Bed & Breakfast Inn is now for sale. Post Falls, Idaho to schedule an appointment.